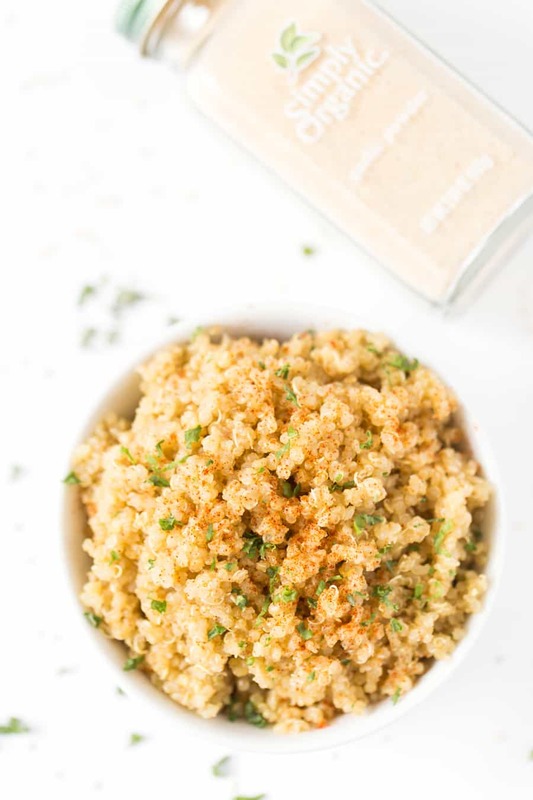 This delicious garlic butter quinoa recipe is one of the easiest recipes you'll ever make! It uses just 5 ingredients, one pan and goes well with everything! I'm visiting my parents in Vermont right now and we've been lucky enough to have some pretty spectacular weather. We got a big snowstorm a few days ago and it's been sunny ever since. The fields around their house are practically sparkling in the sunshine, Trevi is having a blast and I even managed to get out and ski this morning! When I'm up here, I tend to do most of the cooking. Not because my parents don't like to cook, but because I like to take full advantage of their grown-up sized kitchen and test recipes. So far, I've gotten two sweet goodies done, the quinoa paella you saw this week and now this delicious garlic butter quinoa. You guys have really been loving these 5-ingredient recipes – btw if you haven't tried the 5-Ingredient Lemon Turmeric Quinoa, it's a MUST – so we're going to just keep rolling with this theme. Today is all about comfort flavors. We're talking all the butter and ALL the garlic. Those two just go perfectly together! 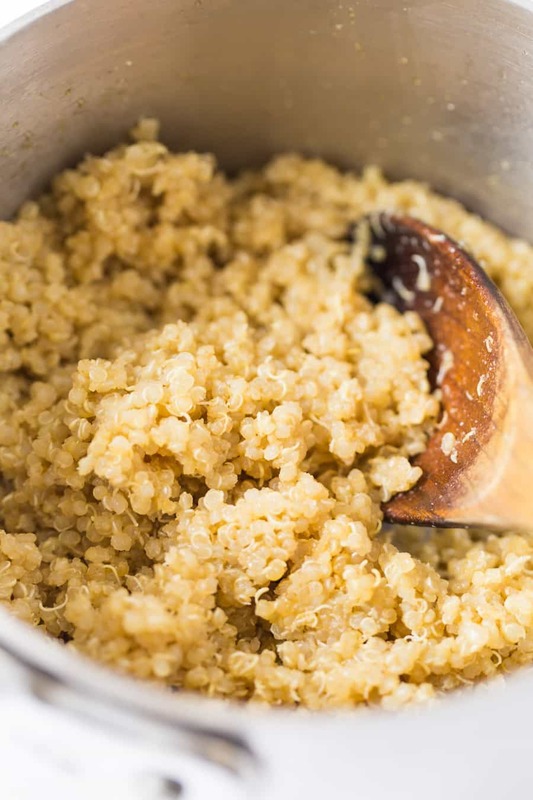 You guys know I don't eat dairy, so I decided to use a vegan butter spread to get that nice buttery flavor into the quinoa, but you could certainly also use regular butter or ghee. 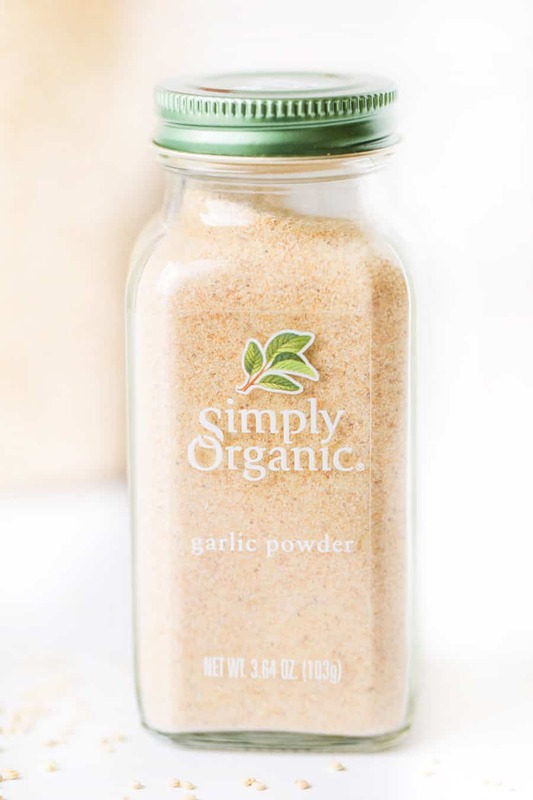 For the garlic, we're using organic garlic powder from Simply Organic. What I love about using their garlic powder – and I use it in pretty much everything – is that you get that nice garlic flavor without having to do an extra step of cooking. No chopping, no mincing, no sauteeing, but still all that incredible garlic flavor. And of course, since it's a powder, it's easy to stir in and gets incorporated evenly throughout the entire dish. Honestly, if I had to choose the top 3 spices I use most frequently, garlic powder would definitely be in that mix. I use it in everything from salad dressings, pasta sauces, homemade dips, and even stir fries. It brings out that intense garlic flavor in a convenient, easy-to-use shaker! In addition to this recipe only using 5 ingredients, you also just need one pot. 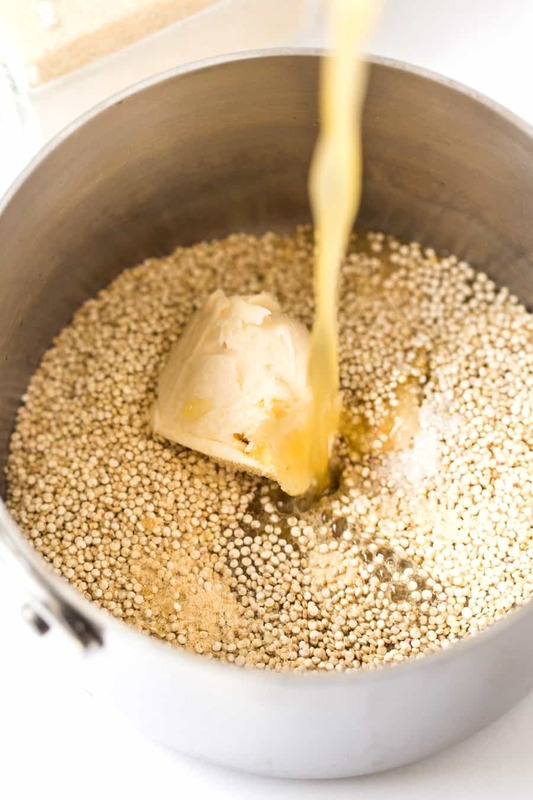 Basically, we're going to cook the quinoa like we normally would – in a liquid, then simmer until fluffy – and just add in the flavorings. So we put the quinoa, garlic powder, butter and salt in the pan, then add the vegetable broth, bring the mixture to a boil and simmer it until it's fluffy. So simple! 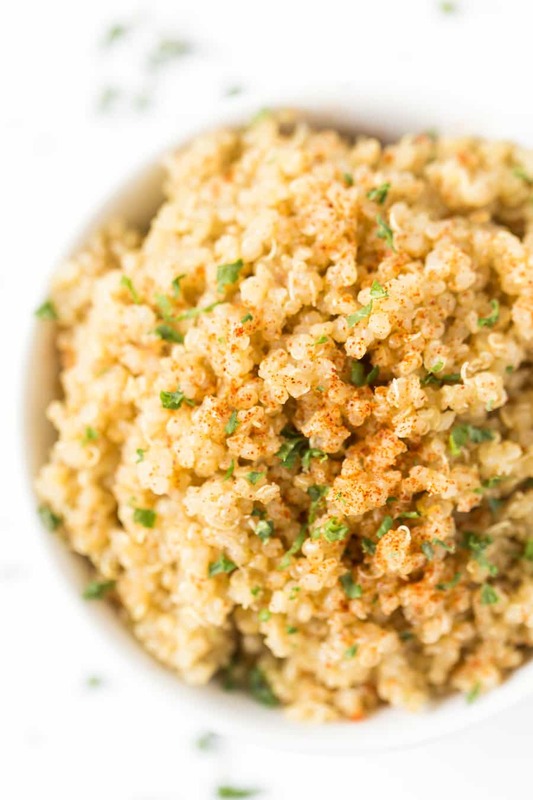 We're using vegetable broth instead of water to help give this garlic butter quinoa even more flavor. The vegetable broth adds a touch of saltiness, while also complementing the butter really nicely. If you're not a veggie broth fan, you have other options. You could use chicken broth, water or you could also do water and a chicken/vegetable bouillon cube. 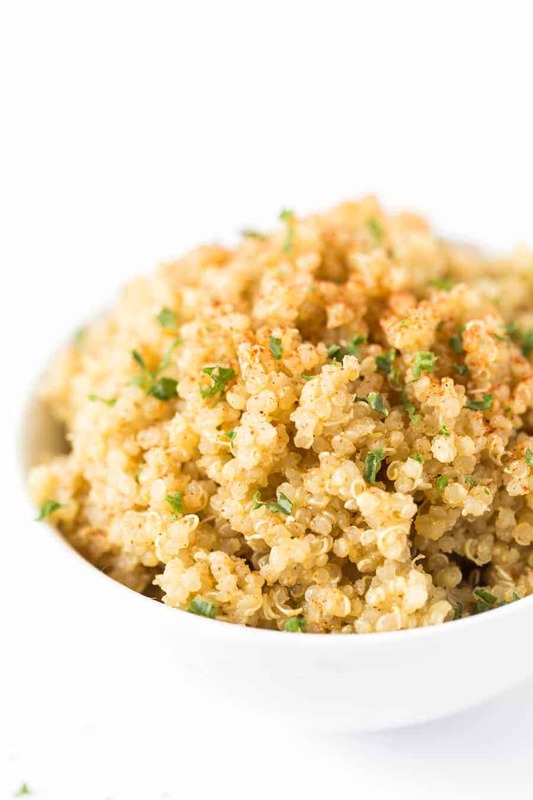 Either method will give you the same effect: a flavorful quinoa dish that goes well with everything! And when I say everything, I really mean it! Well, okay, maybe not a million different ways, but you get the idea. It's a versatile recipe and you're gonna love it! Add all ingredients to a small saucepan. Bring to a boil and stir until butter has melted. Cover and reduce to low and simmer for 15 minutes. Remove lid, take off the heat and fluff with a fork. Let stand for 5 minutes then serve. This post was sponsored by Simply Organic, but as always all opinions are my own. Thank you for supporting me and the companies that make this website possible! 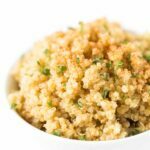 New to cooking quinoa? Grab your FREE Quinoa Starter Guide! 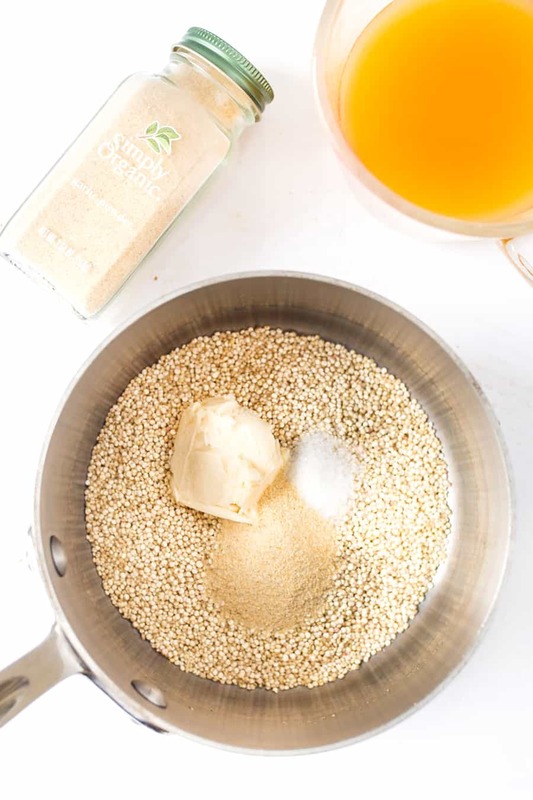 Become part of the Simply Quinoa community and receive weekly emails with exclusive content that I only share in email, as well as my in-depth guide to starting your quinoa journey. 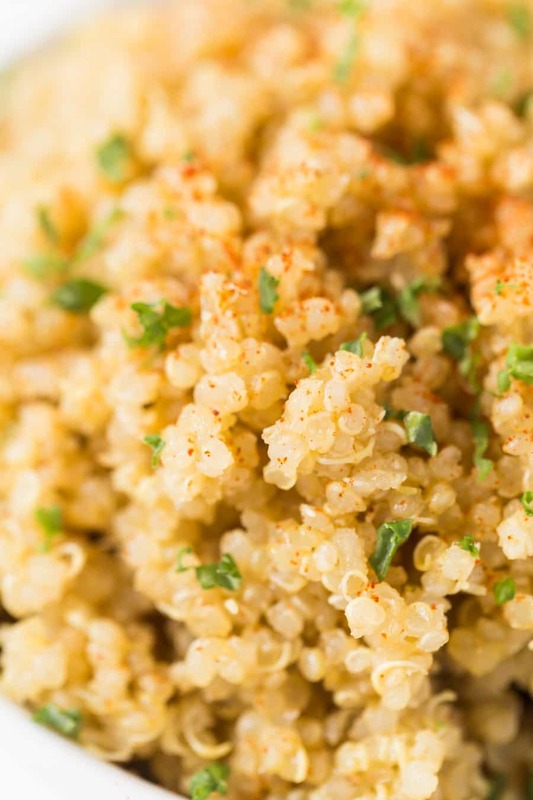 Want more quinoa dinner recipes? Follow my board on Pinterest! tag @simplyquinoa on Instagram with your creations! we love sharing what you make with the community! I can’t wait to see! I’m Alyssa, certified holistic nutritionist and founder of SQ. My goal is to help you take simple, practical and personal steps to living a healthier life so that you can be well + truly healthy. I’ve been looking for more easy recipes that I can quickly make after coming back from a long day of classes. This definitely is one that I’ll be using time and time again. If you don’t like garlic, then this obviously isn’t the recipe for you. After reading some of the other comments, I opted for a little a less garlic than the recipe called for the first time around and in the times that I’ve made it since, I’ve increased the amount of garlic powder. If you love garlic, this is definitely a good recipe to try. Play with it a bit to see how much garlic feels right but otherwise this is awesome and very yummy! Is the nutrition facts label for one serving or all four that the recipe makes? This looks great, could I use olive oil instead of butter (or vegan butter)? I will definitely try it soon! Can I use real garlic? I have some already chopped in a jar that I bought at the store… How much should I use? Sorry it was too strong for you! This sounds so good and I can’t wait to make it however my bag of quinoa states to rinse before cooking. I don’t recall your recipe saying to do that. 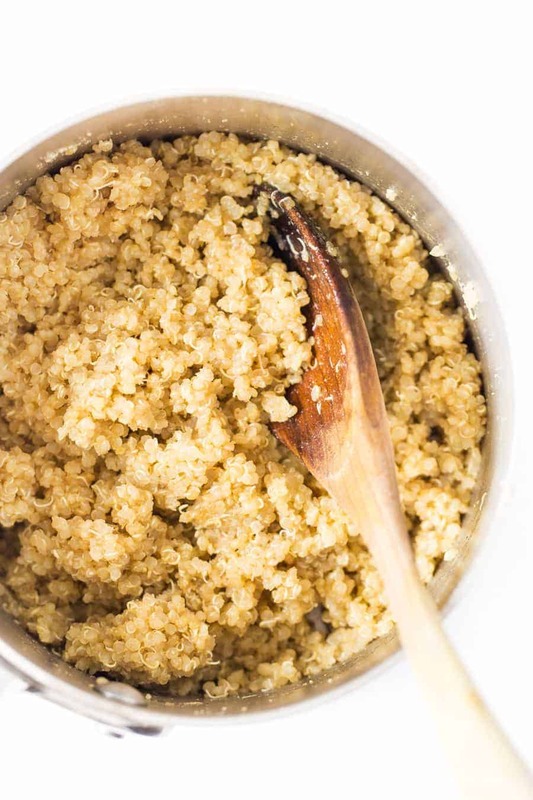 Should we rinse before cooking the quinoa? What’s the green leafy stuff and the red seasoning you used to garnish the quinoa?? Looks delicious I’m trying this tonight! I have made this twice since finding the recipe. It’s amazing and the whole family loves it! Thank you!! Too garlicky! Recipe calls for 3 -4 teaspoons of garlic powder, I used 3 and it was way too much. And I love garlic. Maybe you meant 3/4? I think it depends on your taste! I did mean 3 – 4 🙂 But maybe next time you can cut it down to 1! Thank you so much for this recipe! It is a staple in my kitchen now…never liked quinoa before trying this. I made this last night, it was so good, I used chicken broth, but it was still amazing! Planning on putting the leftovers in my salad! Thanks for the recipe! I am new to cooking with quinoa. Do ALL of the recipes have so many calories and fat??? Can Chicken Broth be used instead of the vegetable? I make this every week now! I love it so much, I always add chopped, sauteed brussel sprouts to it as well- so yummy! Can you give a recipe for homemade vegetable stock. I don’t have one on my blog, but there are tons of recipes on Pinterest/Google! Looks fantastic! I am adding this to my “Quick ‘n’ Easy” recipe list for last minute weeknight meals. Can’t wait to hear what you think! I made this last night, and it was fantastic. So easy! I mixed in a can of chickpeas and topped with roasted Brussels sprouts and parsnips. This is such a great way to use up leftover veggies. Did you mix in a can of chickpeas at the beginning or once the quinoa was done cooking? Either or will be fine! Get our time saving hacks to help you stick to your healthy eating routine! Welcome to Simply Quinoa! Our mission is to help women be well + truly healthy. This is a community that celebrates your own unique health journey, no matter where you are on your path. We will encourage you, inspire you and support you every step of the way. Need some help with dinner tonight? Snag your FREE copy of Dinner in 30 & have a healthy plant-based meal on your table every night!